Halden Hounds are not recommended for apartment life. They are very active indoors and do best with acreage. Energetic and possessing great stamina, the Halden Hound needs plenty of exercise, including a brisk daily walk. It should have a fenced yard of reasonable size to romp in. 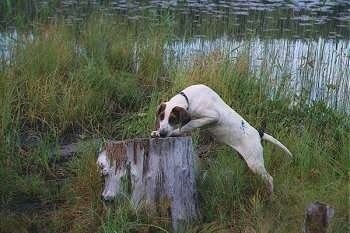 Always use a lead when walking this breed or you will be running the risk of it disappearing in search of wild game. While out on the walk the dog must be made to heel beside or behind the person holding the lead, as instinct tells a dog the leader leads the way, and that leader needs to be the human. Teach your dog to enter and exit door and gateways after the humans. The smooth, shorthaired coat is easy to groom. Comb and brush with a firm bristle brush, and shampoo only when necessary. This breed is an average shedder. The Halden Hound is a rare breed that is seldom found outside of Norway where it originated. It is the smallest of the three Norwegian hare hound breeds. The breed was developed by crossing local Norwegian scenthounds with scenthounds from Germany, England and Sweden in the early 1900s. A breed standard was first established in the 1950s.